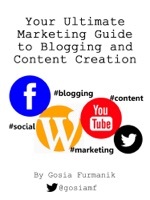 'Your Ultimate Marketing Guide to Blogging and Content Creation' endeavours to point out and explain six crucial elements of the successful marketing strategy for bloggers and small businesses. It covers a range of marketing activities you could try as a blogger or a small business owner to get greater online exposure and boost your conversion. Those activities include, amongst others, producing high quality content (chapter 2). You will have a chance to learn how to set up your brand new blog or website and how to choose the best options available. You will also find out how to get SEO for your website right. In chapter 3, you can read about the importance of networking for building your brand. You’ll also get better understanding of social media for marketing in chapter 4. With the useful checklists included in this chapter, social media marketing will be a plain sail from now on. ‘Understand your audience’ should be your first commandment. Chapter 5 reveals all about how, when and what to do in order to fully get what your audience wants. In chapter 6, you will read about multi-channel marketing and how to take advantage of various digital channels and their broadcasting potentials. Last but not least, in chapter 7 you will find out how to use language, style and tone. when writing for a specific audience. Moreover, you’ll be given a few tips on writing for blogs and marketing collateral.